There were deaths on the home front as well. Five people died when a German Navy Zeppelin airship dropped a string of bombs across Sudbury on 31st March 1916. Thomas Ambrose aged 50 and his wife Ellen aged 37, died in the wreckage of their home 25 East Street, as did their widowed next door neighbour Ellen Wheeler, aged 64. 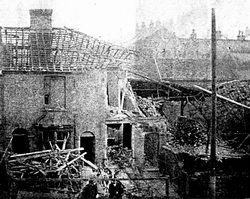 Silk weaver John Edward Smith aged 50, lived opposite and was caught in the blast as he crossed the road. The fifth casualty was Rifleman Robert Valentine Wilson, aged 42, who was mortally wounded by flying glass at his army billet in Constitution Hill. He was serving with a regiment stationed in the town.